A 40-year-old male presented with complaints of gradually progressive, painless defective vision in the left eye. On ocular examination at this presentation, his best-corrected visual acuity was found to be 20/40 in the right eye and 20/80 in the left eye. The intraocular pressure was 12 mmHg in both eyes. 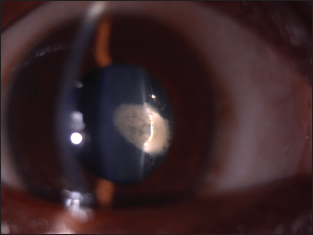 Slit-lamp examination with pupillary dilatation revealed a posterior polar cataract. The discoid-shaped opacity with bending of rays in the center of the posterior capsular plaque was noted. In the image, oval white opacity with dense white spots at the edges can be seen. The answer to the spot diagnosis of the previous issue: Brown's syndrome Right eye.